Carnival Of Debt Reduction - It's Working Edition!Eliminate The Muda! « If You Lived 130 Years? Carnival Of Debt Reduction - It's Working Edition! For those of us that want to see a reduction in consumer debt – Yippeee!!! It’s happening, according to the Federal Reserve Statistical Release. Consumer credit decrease at an annual rate of 8.5%. Revolving credit decreased by an annual rate of 18.5%. If you want to know who deserves credit for making this happen, take a few minutes to read the posts listed here! Bob with ChristianPF introduces us to a series of posts on Resources and ways to cut your debt load. 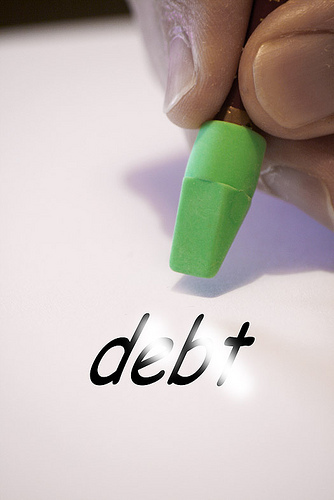 Kris at Debt-Tips shares Top 5 Warning Signs That You Should Avoid A Debt Settlement Company. ThriftyGal writing for Studenomics passes along 5 Ways Girls Waste Money. Austin’s guest post for The Digerati Life believes a sound education will prevent debt reduction, he writes Get A Financial Education In Your Twenties. Stacey Doyle writing for The Smarter Wallet asks Are Debt Counseling Services The Way To Debt Relief? David Lampson at Personal Finance Analyst introduces his Credit Card Debt Consolidation Loan Guide. Hawk at the The Debt Hawk addresses the benefits and pitfalls of Paying Off Credit Card Debts With Loans. TJ with Downturn Living gives insight on using tools to help Surviving Debt Recovery: Watch Out For That Tree! FinEngr, the engineer of Engineer Your Finances makes us think about Convenience Tax: You’re Only Charging Yourself. Paul, the FiscalGeek and pioneer of the homemade air conditioner shares a reader’s story about Retired Early, In Debt, No Job: When the American Dream Becomes a Nightmare! OK, so maybe personal finance bloggers didn’t reduce the nations dependence on credit single handed; but we have seen enough testimonials to know that bloggers do make a difference in many peoples lives. Would you like to make a difference? Are you a blogger? Would you like to gain more readership and participate in a popular carnival? If so, write a post about Debt Reduction and submit it to the Carnival of Debt Reduction. 8 comments to Carnival Of Debt Reduction – It’s Working Edition! Thank you very much for linking to my article about paying off credit card debt with loans. I hope the carnival readers like it!! .-= TheDebtHawk.com´s last blog ..Bank Rates Guide =-. Thanks so much for featuring my post, I’m indeed in great company. .-= Paul @ FiscalGeek´s last blog ..Save by Dropping Your GAP Automobile Insurance =-. Thanks for the link. Never had someone call me the “doctor of studenomics” before but I’ll accept it. .-= MD @ Studenomics´s last blog ..Best of Money Carnival #35: All Over The Place Edition =-. Debt settlement seems to be known as a true option for consumers suffering with debt. For serveral years I have been oberserving the debt market pretty closely and it is difficult to tell what you are getting for the money. It is obvious that there are a great number or debt settlement companies in the market that serve up terrific services and the customers honestly get great benefit, but I also know there are tons of service providers out in the market that are focused on collecting fees and enrolling new clients. I am sure this is why there is new fed regulation managing the debt consolidation industry. My nephew utilized a debt consolidation service provider and seems to be very very very happy with the result.